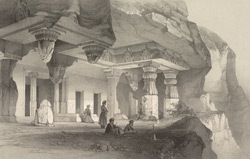 This is plate 10 from James Fergusson's 'Illustrations of the Rock Cut Temples of India'. Fergusson wrote of Ajanta: "[T]he Caves are almost the only object of antiquity in India, to which the learned in Europe have turned their attention, or of which travellers have thought it worth while to furnish descriptions, or whose history they have attempted to elucidate." This vihara (monastery) at Ajanta has been dated to the end of the 5th century. Unusually it has no internal hall. It has two small porches supported by massive octagonal pillars with fluted, cushion-shaped capitals. The overhanging roof of the cave has decorative horse-shoe shapes. A shrine in the rear wall holds both a seated and a standing Buddha.